OK Boys & Girls, let’s talk about cocktails. And especially the sublime drink called the Old Fashioned. Cocktails are arguably one of America’s great gift to the world. The French have their wine, the Brits and Germans have their beer, the Scots perfected whisky and the Mexicans gave us Tequila. But it was us Yanks who started combining spirits with other ingredients to create a concoction wholly different than the sum of its parts. That definition “spirits, sugar, water, and bitters” sounds like the drink that we know as the Old Fashioned. That is because it is. This original recipe was called a Whiskey Cocktail. Later, as cocktails became more and more complicated and other ingredients were added, many customers would ask for a cocktail make “the Old Fashioned way”. This, eventually, was shortened to just “Old Fashioned”. So this cocktail that we call the Old Fashioned is one of the original cocktails, dating back to the early 19th century. It’s popularity took a hit during, and immediately after, our Prohibition experiment. But it regained its standing during the 1950s and 1960s as evidenced by the Old Fashioned being the cocktail of choice of Don Draper in Mad Men. So…here we are today, and the Old Fashioned is one of the pantheon of cocktails. I want to share with you a recipe for an Old Fashioned that was made for me by celebrity bartender Charles Joly. 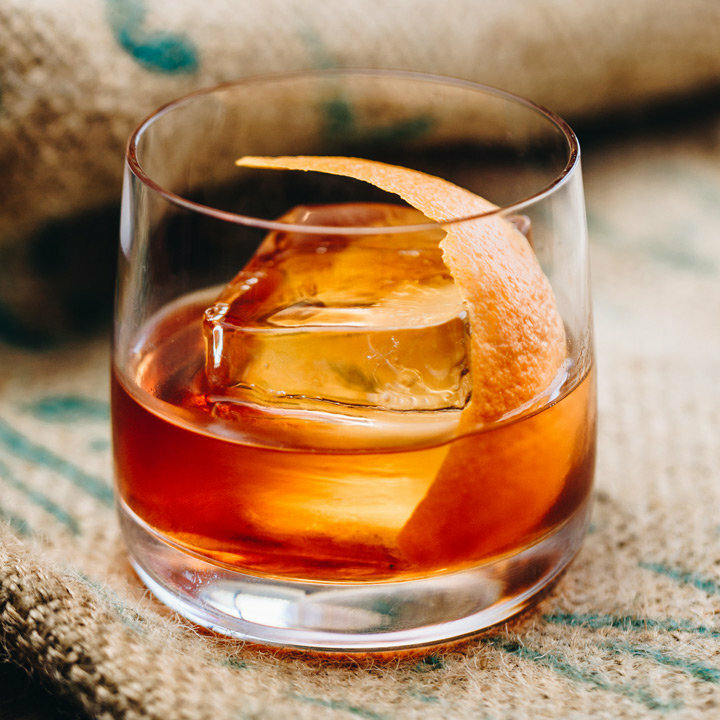 It was the best Old Fashioned I ever had…and the reason it was so good can be traced to a single ingredient: Smoked Sugar. That’s right. Smoked sugar gives this drink a complexity not found in the fruit-muddled sugar-y sweet concoction that a lot of bartenders throw at you. It is simple to make and very satisfying. Oh…by the way…we sell the Bourbon Barrel Smoked Sugar at our store. Stop in and get some and try this recipe. You won’t be disappointed. Use Bourbon Barrel Smoked Sugar to make a simple syrup using equal parts sugar and water. Add whiskey, simple syrup and bitters over ice in a Double Old Fashioned glass. Stir well, add more ice if needed. Mist with orange twist and put on top of cocktail and serve.